Vermiculite is a classic, loose-fill insulation solution for hard-to-reach areas in the loft. It’s ideal for use between irregular joists and for filling the spaces around tricky pipes. The main advantages of vermiculite include its ease of use, resistance to rot and relatively low cost. It’s also non-toxic and fireproof – hence its popularity as chimney back-fill insulation. 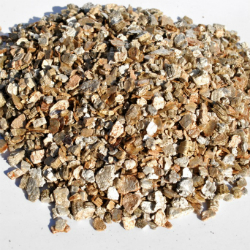 We provide exfoliated vermiculite from Micafil, the UK’s leading manufacturer. The insulation is delivered in light, 100 Litre bags which are easy to handle, even on a ladder or in a cramped loft space. Traditionally, vermiculite is poured from the bag, though a bucket or jug can also be used in a very tight space. Along with loose-fill vermiculite we also stock a wide range of other insulating products for DIY or professional use, including PIR Board and multi-layer foils like Superquilt. The team here at Ashbrook Roofing Supplies have over 30 years of experience in the roofing trade and we’re always happy to share practical tips and advice on your insulation problems.